Denver International Airport Daily non-stop trips from DIA to Estes Park. Meet us at door 513, east side. Transportation to Hotels Door-to-door service to all hotels, lodges, conference centers, and residences in the Estes Park area. Wedding Transportation Let us transport you and your guests safely to and from your wedding venue. Tours Come see the beauty that is Estes Park and Rocky Mountain National Park. Change in Airport pick-up location: Our pick-up location at Denver International Airport has changed. We will now be located outside door 513 on Island 1. Cancellation Policy: Cancellations made less than 24 hours before time of travel are non-refundable. Cancellations may be made by phone (970) 586-5151, or by email (estesparkshuttle@aol.com). There will be a $5.00 cancellation fee for refunds. We will no longer be issuing credit for future travel, but will continue to honor those already issued. We offer reliable, daily scheduled shuttle service to and from the Denver International Airport and Estes Valley Area. We are the only licensed and commissioned shuttle company to offer this service to visitors and residents alike to and from Estes Park, Allenspark, Peaceful Valley and Lyons, Colorado! Our authority is granted by the Colorado Public Utilities Commission and therefore our drivers must pass driving and security clearance checks ... all to provide a successful service to you! With an advanced reservation, we can pick you up at the Denver International Airport, AMTRAK and Greyhound stations in Denver, Lyons, the Millenium Harvest House Hotel or RTD Bus Stop in Boulder or the Super 8 Motel in Longmont and bring you to your Hotel, residence or location in the Estes Valley Area, or vice versa. It takes approximately two hours to travel from the Denver International Airport to the town of Estes Park. The distance is about 80 miles. 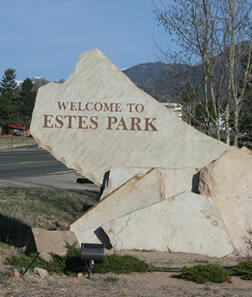 The 20 miles closest to Estes Park is a mountain climb of almost 3,000 feet. Our company can also provide transportation for weddings, groups, and tours. Check out our website for more information. Enjoy your vacation in Estes Park, Colorado. Estes Park Shuttle is the transportation company to fit all of your needs.